Henna artist and owner of Happy Henna in Grand Rapids, Michigan Amanda Joy began volunteering her time at Beautiful You Salon by Profile giving henna tattoos and henna crowns to women battling cancer since 2015. She knew the healing power of Art Therapy as she had used henna as a meditational tool for herself when dealing with her own anxiety. Hearing the stories of many women who she had met each month, gave her a desire to share these women’s stories with the world. In 2016 she created the idea of “Crowns of Courage” which was displayed during ArtPrize in 2017. It was voted top 5 with 384,053 votes and recieved the Veterans award. 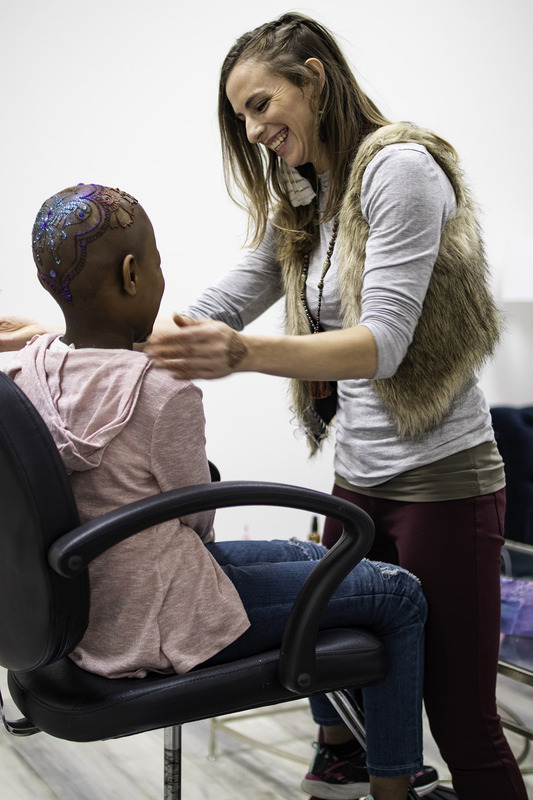 Henna Crowns of Courage is a 501c3 nonprofit organization, empowering women and children who have lost their hair due to chemotherapy by adorning them with free, elaborate, personal, lavender infused henna designs that lasts up to two to three weeks on the crowns of their heads. We incorporate makeup, photographer and videography to share their stories and bring awareness to different types of cancer. We also have an online community where the women can connect, communicate and share their lives together. We empower women to choose love over fear during a time that impacts them on a physical, emotional, mental and psychological level. Helping them to feel beautiful in bald, knowing it is only temporary and helping them find the strength and confidence within themselves. Amanda Joy has been used her passion and her artistic skills to empower women across the country and around the world. She has been a public speaker sharing positive mindset, therapeutic healing through art and the power of choosing love over fear in front of Churches, international Rotary Clubs, Schools, and Cancer centers. Recently Amanda Joy was honored to be a teacher at East Coast, West Coast Henna Conference in Atlanta, Georgia and a speaker for the International Womens Conference in New, Dehli India. Click here to invite Amanda Joy to speak at your next event. Henna is a 5,000 year old art that goes back to ancient Egypt. It is a grounding, therapeutic, healing art that has been used across many religions and demographics to bring about protection and beauty. It is temporary to remind you that everything is life is temporary. What you are going through now will soon fade just like this tattoo and bring you into a new power. It is there to be a mark of blessing, a reminder for you to speak love over your body. Transform your thinking to positive affirmation. Your thoughts are the beginning of the healing process.